You are currently browsing the category archive for the ‘On Faith’ category. 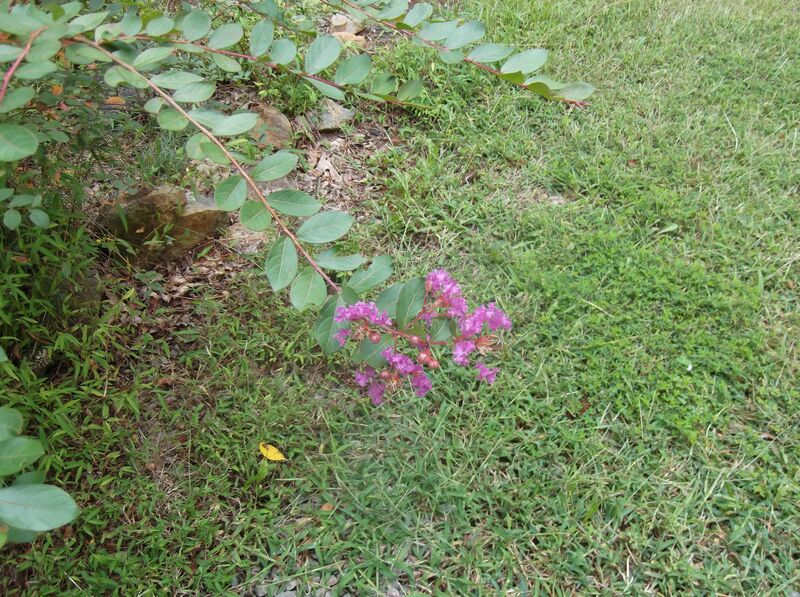 Last year I put off pulling the weeds growing in my flower bed, and when I finally started the dreaded task I discovered a baby crape myrtle or at least I thought it was a crape myrtle. I compared its tiny leaves with the big bush we planted after we built our house. They looked similar enough for me to save it from a weed’s fate. Last week, I pulled into the driveway and saw the little tree had a nice dark pink bloom. I was ecstatic and shared the good news with my husband. I don’t know much about dendrology(my new word for the week) so I searched the Internet for information. 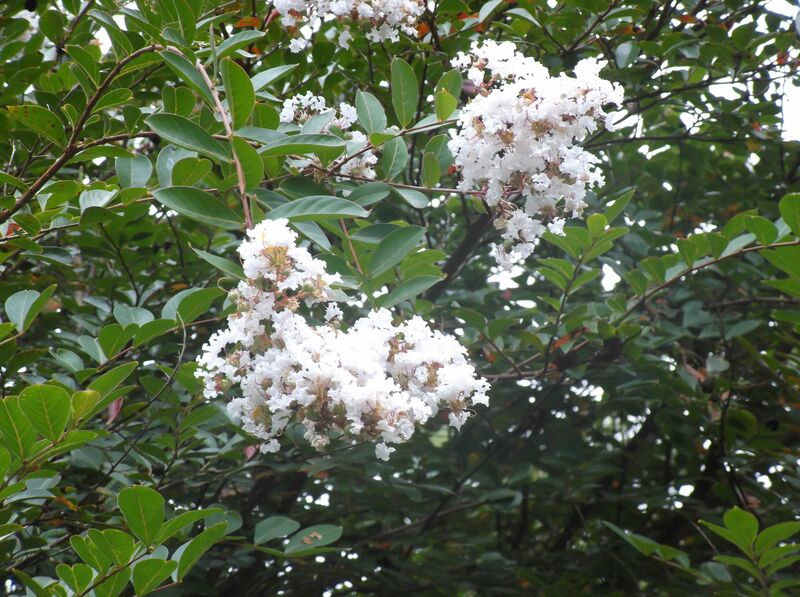 The great mystery is that my original bush was supposed to have been a dwarf tree, instead it is huge–well over the 6 feet AND it has WHITE blooms– not pink like the little tree that seems to have been planted by God. 26 If you then are not able to do the least, why are you anxious for the rest? 27 Consider the lilies, how they grow: they neither toil nor spin; and yet I say to you, even Solomon in all his glory was not arrayed like one of these. 28 If then God so clothes the grass, which today is in the field and tomorrow is thrown into the oven, how much more will He clothe you, O you of little faith? For what I do is not the good I want to do; no, the evil I do not want to do–this I keep on doing. Am I the only one who identifies with Paul as he writes those words? Sometimes I think I must be the only one. But instead of doing those things of far greater value, I watch TV or daydream or worry about what someone else has. Verse 24 of Romans 7 asks the question, Who will rescue me from the body of death? Paul doesn’t leave us hanging with the answer. Verse 25 says Thanks be to God–through Jesus Christ our Lord! He is always the answer. 24 What a wretched man I am! Who will rescue me from this body of death? 25 Thanks be to God—through Jesus Christ our Lord! I recorded Kirk Cameron’s film, Monumental, last night, watched it this morning and wanted to see the opposing viewpoints written about it. The video within the article contains a clip from the movie which states that Congress funded the first Bible printed in America. The author disputed that fact, so I wanted to find out for myself. 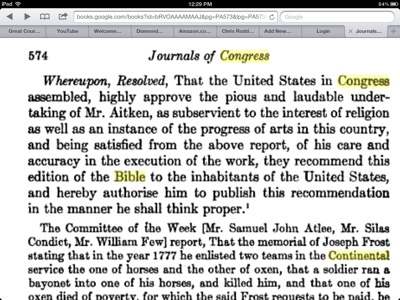 Page 572 begins the discussion and page 574 gives the Congressional resolution about the Aitken Bible. It’s just a book, right? Harmless. If it were so harmless, then why are “they” so against it being handed out? Or read? Or studied as art as the Continental Congress mentioned? 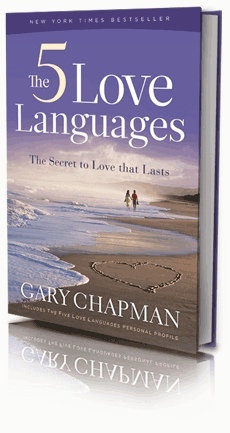 Because it is not just a book. Nor is it harmless. Because it has very real consequences. God’s word is alive and working and is sharper than a double-edged sword. It cuts all the way into us, where the soul and the spirit are joined, to the center of our joints and bones. And it judges the thoughts and feelings in our hearts. I can see why some are uncomfortable with it. I don’t expect to convince the author of the Huffington Post article to be swayed in any way by my words. Nor will I be swayed by hers. But I am swayed by the words in that Powerful, Holy, Living Book (whether or not our forefathers approved of it). Call me crazy if you must.